Library image #34: Coastal islands. The United States Congress designated the Washington Islands Wilderness (map) in 1970 and it now has a total of 452 acres (451.5 acres, technically). All of this wilderness is located in Washington and is managed by the Fish and Wildlife Service. Washington Islands Wilderness is located off the the Olympic Coast within the Washington Islands National Wildlife Refuges, established by Theodore Roosevelt. Washington Islands is comprised of Flattery Rocks, Quillayute Needles, and Copalis, stretching off-shore from Cape Flattery all the way south to Copalis, Washington. More than 600 islands, rocks, and reefs make up this unit, and all but Destruction Island are designated as Wilderness along with several hundred acres of unsurveyed lands above the line of mean high water. The islands range insize from less than 1 acre to about 36 acres, and most drop abruptly into the sea. They provide nesting habitat for more than 70 percent of Washington's seabirds and support some of the largest seabird colonies in the continental United States. Some of the highlighted species include common murre, tufted puffin, Brandt cormorant, and rhinoceros auklet. Marine mammals such as the charismatic sea otter, harbor seal, Steller sea lion, California sea lion, and northern elephant seal regularly haul out onto the islands to rest, and they commonly feed in waters surrounding the Wilderness. To prevent disturbance to extremely sensitive seabirds and marine mammals, Washington Islands Wilderness is closed to public entry year round and waters within 500 feet are designated as a voluntary closure to all watercraft. Ten of the National Wilderness Preservation System's 803 wilderness areas are closed to access and use by the general public. Most of these closed areas are managed by the Fish and Wildlife Service. The core mission of the Service's National Wildlife Refuge System is conservation of native fish, wildlife, plants, and their habitats. 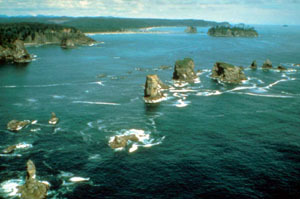 The Washington Islands Wilderness, part of the Copalis National Wildlife Refuge, Flattery Rocks National Wildlife Refuge and Quillayute Needles National Wildlife Refuge, is closed to visitation to protect wildlife and other natural, cultural, and/or other resources consistent with the conservation purpose(s) of the refuges. Wilderness designation provides an additional level of protection for the wilderness portions of these refuges, but does not open the area to public access or use.